Robert II (27 March 972 – 20 July 1031), called the Pious (French: le Pieux) or the Wise (French: le Sage), was King of the Franks from 996 to 1031, the second from the House of Capet. He was born in Orléans to Hugh Capet and Adelaide of Aquitaine. Robert distinguished himself with an extraordinarily long reign for the time. His 35-year-long reign was marked by his attempts to expand the royal domain by any means, especially by his long struggle to gain the Duchy of Burgundy. His policies earned him many enemies, including three of his sons. He was also known for his difficult marriages: he married three times, annulling two of these and attempting to annul the third, prevented only by the Pope's refusal to accept a third annulment. Immediately after his own coronation, Robert's father Hugh began to push for the coronation of his son. "The essential means by which the early Capetians were seen to have kept the throne in their family was through the association of the eldest surviving son in the royalty during the father's lifetime," Andrew W. Lewis has observed, in tracing the phenomenon in this line of kings who lacked dynastic legitimacy. Hugh's claimed reason was that he was planning an expedition against the Moorish armies harassing Borrel II of Barcelona, an invasion which never occurred, and that the stability of the country necessitated a co-king, should he die while on expedition. Ralph Glaber, however, attributes Hugh's request to his old age and inability to control the nobility. Modern scholarship has largely imputed to Hugh the motive of establishing a dynasty against the claims of electoral power on the part of the aristocracy, but this is not the typical view of contemporaries and even some modern scholars have been less sceptical of Hugh's "plan" to campaign in Spain. 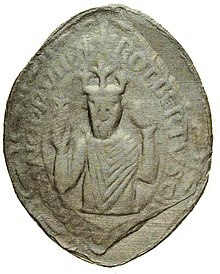 Robert was eventually crowned on 25 December 987. A measure of Hugh's success is that when Hugh died in 996, Robert continued to reign without any succession dispute, but during his long reign actual royal power dissipated into the hands of the great territorial magnates. Robert had begun to take on active royal duties with his father in the early 990s. In 991, he helped his father prevent the French bishops from trekking to Mousson in the Kingdom of Germany for a synod called by Pope John XV, with whom Hugh was then in disagreement. As early as 989, having been rebuffed in his search for a Byzantine princess, Hugh Capet arranged for Robert to marry Rozala, the recently widowed daughter of Berengar II of Italy, many years his senior, who took the name of Susanna upon becoming queen. She was the widow of Arnulf II of Flanders, with whom she had two children. Robert divorced her within a year of his father's death in 996. He tried instead to marry Bertha, daughter of Conrad of Burgundy, around the time of his father's death. She was a widow of Odo I of Blois, but was also Robert's cousin. For reasons of consanguinity, Pope Gregory V refused to sanction the marriage, and Robert was excommunicated. After long negotiations with Gregory's successor, Sylvester II, the marriage was annulled. Finally, in 1001, Robert entered into his final and longest-lasting marriage—to Constance of Arles, the daughter of William I of Provence. Her southern customs and entourage were regarded with suspicion at court. After his companion Hugh of Beauvais urged the king to repudiate her as well, knights of her kinsman Fulk III, Count of Anjou had Beauvais murdered. The king and Bertha then went to Rome to ask Pope Sergius IV for an annulment so they could remarry. After this was refused, he went back to Constance and fathered several children by her. Her ambition alienated the chroniclers of her day, who blamed her for several of the king's decisions. Constance and Robert remained married until his death in 1031. Robert was a devout Catholic, hence his sobriquet "the Pious." He was musically inclined, being a composer, chorister, and poet, and made his palace a place of religious seclusion where he conducted the matins and vespers in his royal robes. Robert's reputation for piety also resulted from his lack of toleration for heretics, whom he harshly punished. He is said to have advocated forced conversions of local Jewry. He supported riots against the Jews of Orléans who were accused of conspiring to destroy the Church of the Holy Sepulchre in Jerusalem. Furthermore, Robert reinstated the Roman imperial custom of burning heretics at the stake. In 1030–1031, Robert confirmed the foundation of Noyers Abbey. The kingdom Robert inherited was not large and, in an effort to increase his power, he vigorously pursued his claim to any feudal lands that became vacant, usually resulting in war with a counter-claimant. In 1003, his invasion of the Duchy of Burgundy was thwarted, and it would not be until 1016 that he was finally able to get the support of the Church to be recognized as Duke of Burgundy. The pious Robert made few friends and many enemies, including three of his own sons: Hugh, Henry, and Robert. They turned against their father in a civil war over power and property. Hugh died in revolt in 1025. In a conflict with Henry and the younger Robert, King Robert's army was defeated, and he retreated to Beaugency outside Paris, his capital. He died in the middle of the war with his sons on 20 July 1031 at Melun. He was interred with Constance in Saint Denis Basilica and succeeded by his son Henry, in both France and Burgundy. 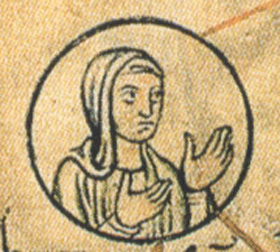 Hedwig (or Advisa), Countess of Auxerre (c. 1003 – after 1063), married Renauld I, Count of Nevers on 25 January 1016 and had issue. Adela, Countess of Flanders (1009 – 5 June 1063), married (1) Richard III of Normandy and (2) Count Baldwin V of Flanders. 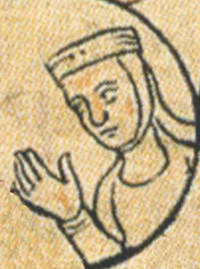 Constance (1014–1052), married Count Manasses de Dammartin. Robert also left an illegitimate son: Rudolph, Bishop of Bourges. ^ Andrew W. Lewis, "Anticipatory Association of the Heir in Early Capetian France" The American Historical Review 83.4 (October 1978:906–927) p. 907; the last co-king was Philip Augustus, who was co-king to the ailing Louis VII. ^ Robert Fawtier, The Capetian Kings of France, transl. Lionel Butler and R.J. Adam, (Macmillan, 1989), 48. ^ The letter composed by Gerbert survives, though no Byzantine response is recorded: Constance B. Bouchard, 'Consanguinity and Noble Marriages in the Tenth and Eleventh Centuries" Speculum 56.2 (April 1981:268–287) pp 274, 276. ^ The most complete account of the marriages of Robert II remains that of Charles Pfister, Etudes sur le règne de Robert le Pieux (Paris 1885:41–69); see Constance Bouchard 1981:273ff. ^ James Palmer, The Apocalypse in the Early Middle Ages, (Cambridge University Press, 2014), 215. ^ Nolan. Capetian Women. p. 13. ^ The Complete Jewish Guide to France. ^ MacCulloch, Diarmaid. A History of Christianity. Penguin Books, 2010, p. 396. ^ Chevalier, C. (1872). Cartulaire de l'Abbaye de Noyers. Tours: Guilland-Verger, Georget-Joubert. pp. charter I. ^ Constance Brittain Bourchard, Sword, Miter, and Cloister: Nobility and the Church in Burgundy, 980-1188, (Cornell University Press, 1987), 343. Robert I of Burgundy, known as Robert the Old and "Tête-Hardi", was Duke of Burgundy from 1032 to his death. Robert was son of King Robert II of France and brother of Henry I of France. Adbelahide or Adele or Adelaide of Aquitaine, was queen consort of France by marriage to Hugh Capet.